I recently received a free sample (in a sample pack that came with something I bought) for Simplyclean laundry powder. I’d never heard of Simplyclean before, but the brand statements on the label were talking my language (no nasties and cruelty free) so I decided I had to find out more. It turns out that the Simplyclean range was developed by a husband and wife duo from their base in the Northern Rivers region of NSW, and offers a healthy alternative for household cleaning with ‘human-safe and earth-safe’ home cleaning, pet care and personal care products. 1. I understand that your finished product isn’t tested on animals, but have the ingredients you use to make your products been tested on animals? No. None of our ingredients have been tested on animals. Also, it’s worth noting that we do have two products that have been tested on animals – the Pet Shampoo and Pet Conditioner – and our labrador Lulu loved them! 2. Do you distribute your products in any markets that require your products to be tested on animals (e.g. China)? No. Our products are sold only in Australia. 3. Are you owned by a parent company – and if so who? No. We are a small, family business based in Lismore, in the beautiful Northern Rivers Region of NSW. 4. Do you use palm oil in your products and if so is it from a sustainable source? No. There is no palm oil used in any of our products or the packaging. The ‘tongue-in-cheek’ reference to the Pet Shampoo and Pet Conditioner being tested on animals made me laugh – but I was assured that this was a brand that ticks all of my product-requirement boxes. I prefer not to use chemicals around the home – and so the plant-based Murchison Hume Counter Intelligence Spray is my usual go to for cleaning the counter tops and sinks – but every now I do find myself looking for something with a little more ‘grime-removing’ power. 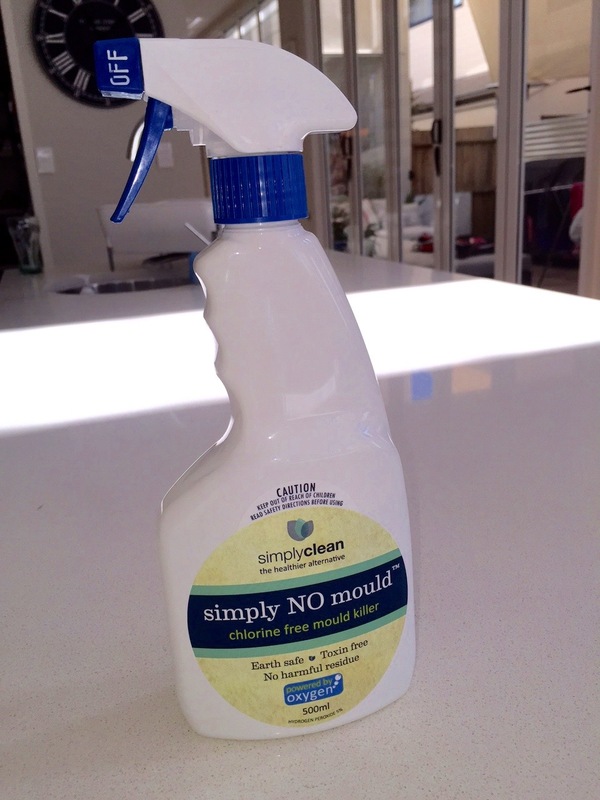 I decided to give the Simplyclean Simply No Mould a test run which, unlike usual mould sprays, is both chlorine and toxin free. 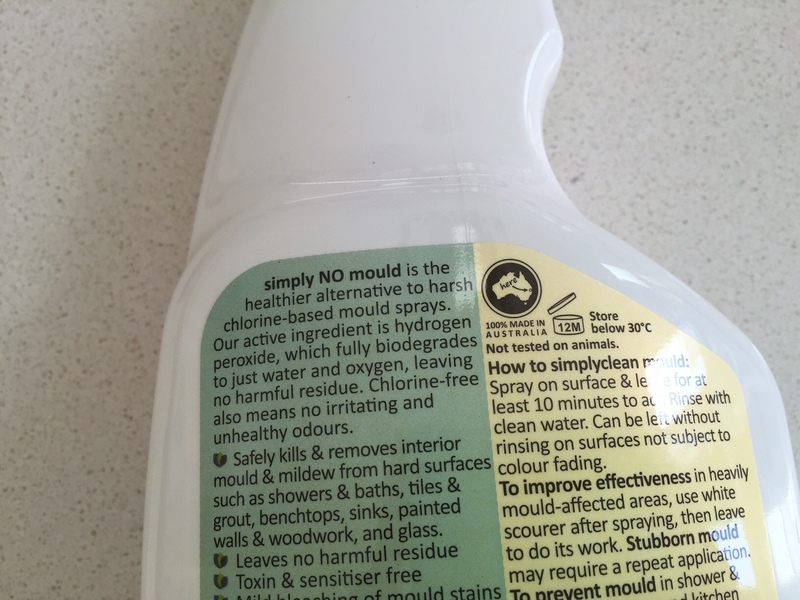 As it says on the label, the active ingredient is hydrogen peroxide which after working its mould-removing magic simple breaks down to oxygen and water. The first thing I noticed about the product is the smell. Normal mould removers have me coughing and gasping – but there’s no harsh smell at all with this spray. As recommended, I sprayed my kitchen counter tops and left it for ten minutes. Ten minutes later everything was sparkling – so I decided to move onto the real test … the bathroom. Given the lack of heavy-duty chemicals I did need to use a little elbow grease and a scourer to remove some of the stubborn mould around the tiles in the shower – but that’s a price I’m willing to pay to clean without nasty chemicals.